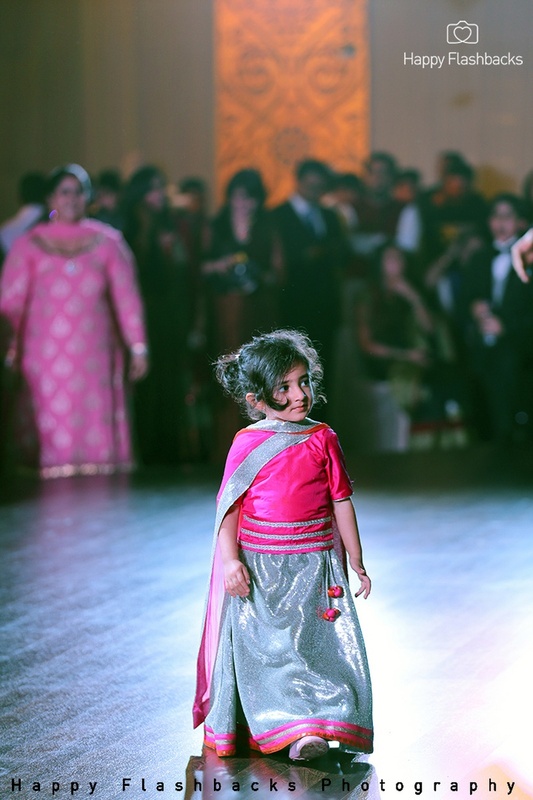 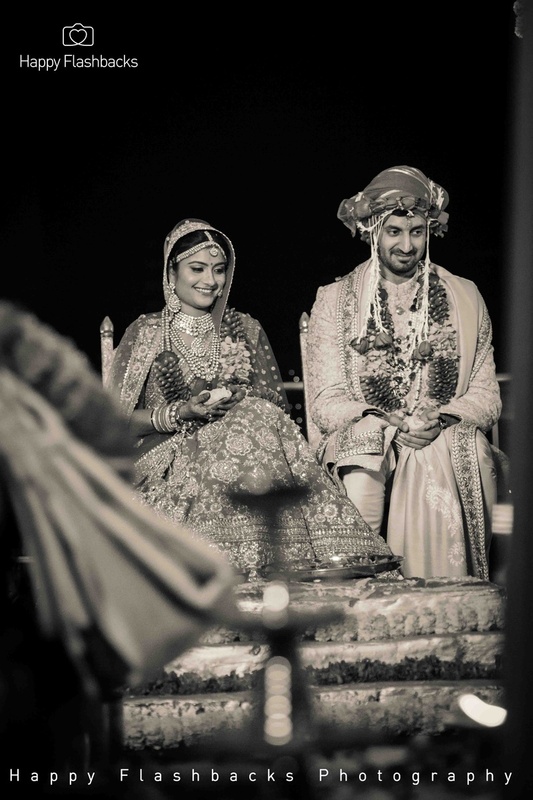 Tushi and Vaibhav’s wedding is one for the storybooks. 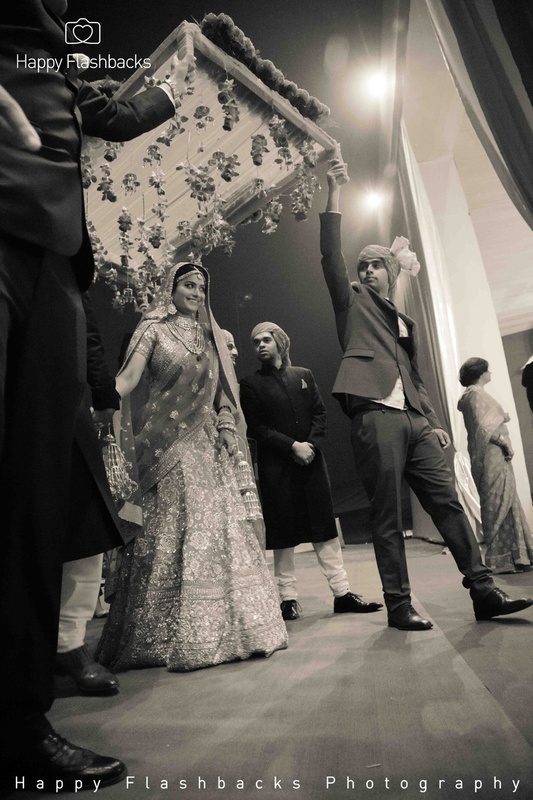 We have to admit, it had us a bit dumbfounded. 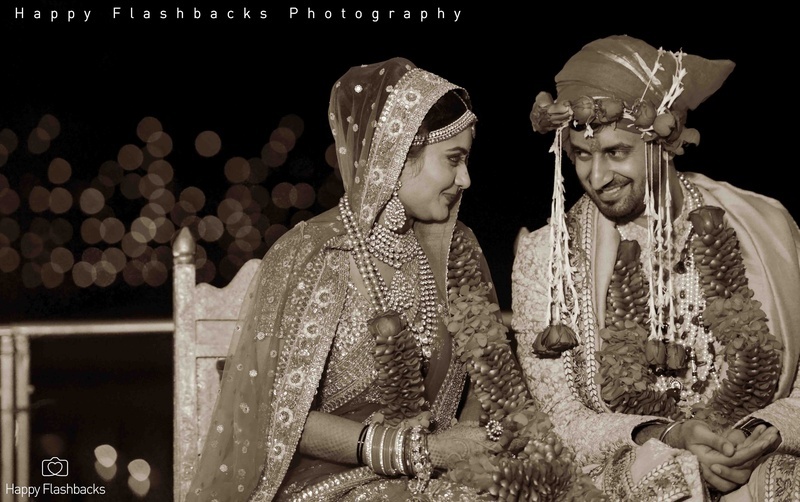 Should be talk about the décor, the photography, the mood, the outfits or just how stunning these two people are? 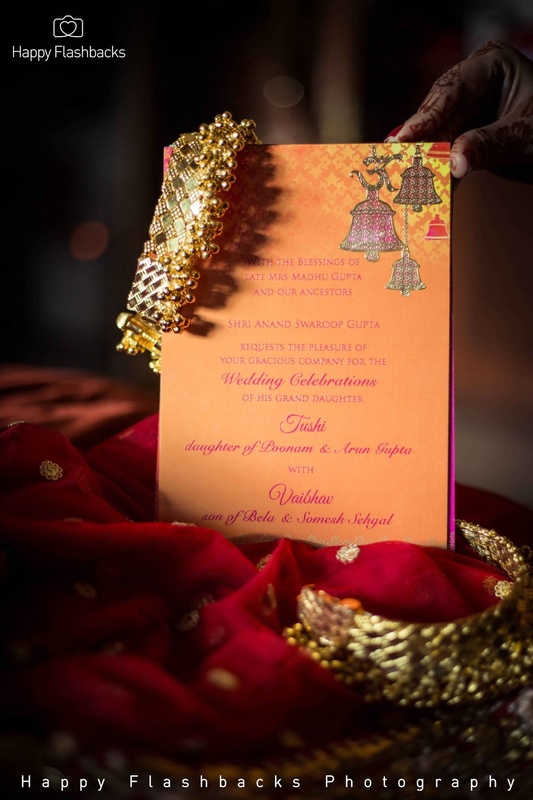 Brimming with inspiration and ideas, the beauty of this tasteful celebration lies in the simplicity of design, attention to detail and immaculate execution. 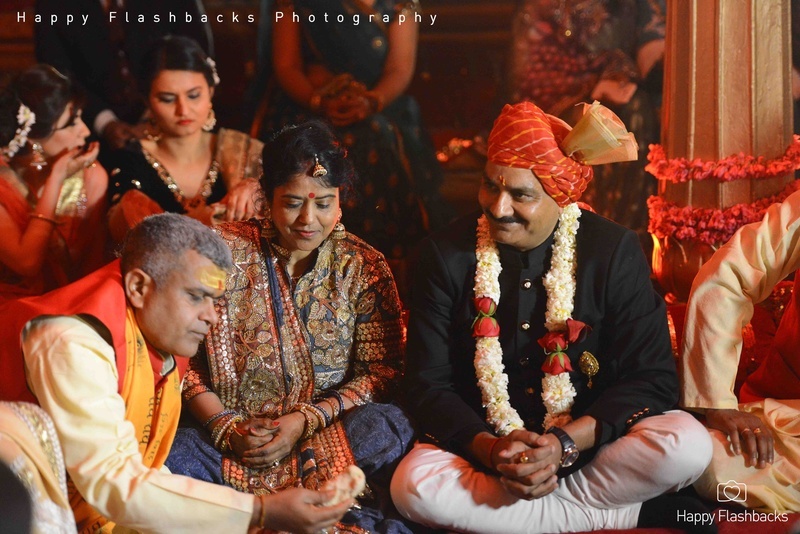 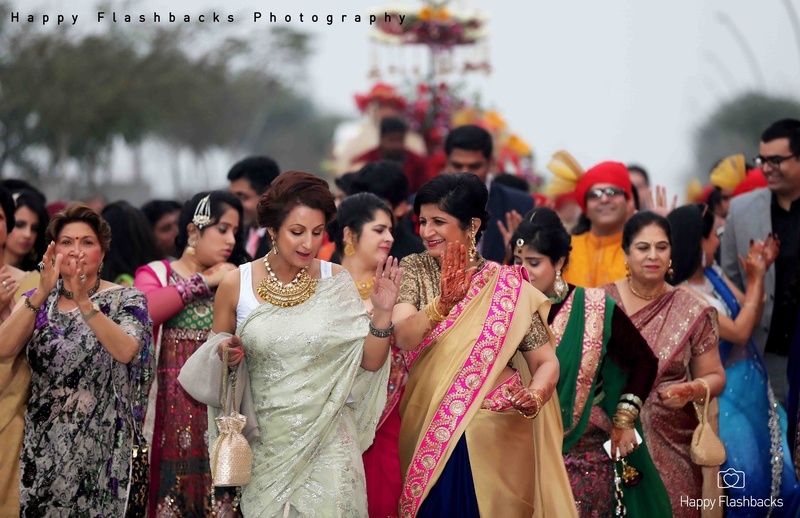 Whether it was the glorious,outdoor wedding venue (United Golf Course, Noida) which became the perfect backdrop for an elaborate Vedic, wedding ceremony or the bride herself, a deity like vision draped in Sabyasachi - a celebration of inner beauty remained the emphasis at this wedding. 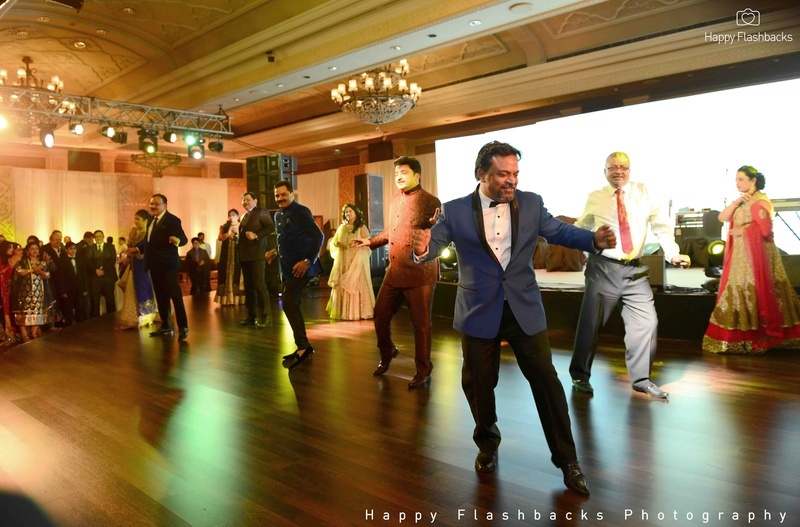 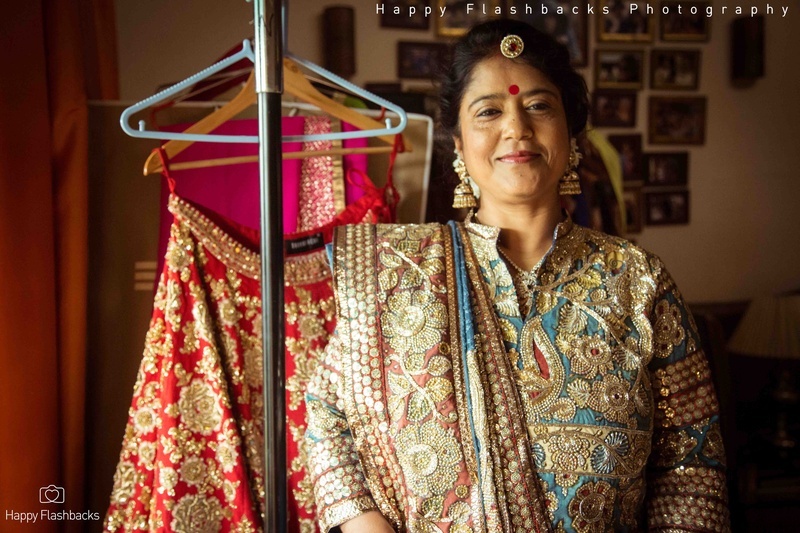 Happy Flashbacks, demonstrated a mastery and finesse over their lens while documenting this wedding. 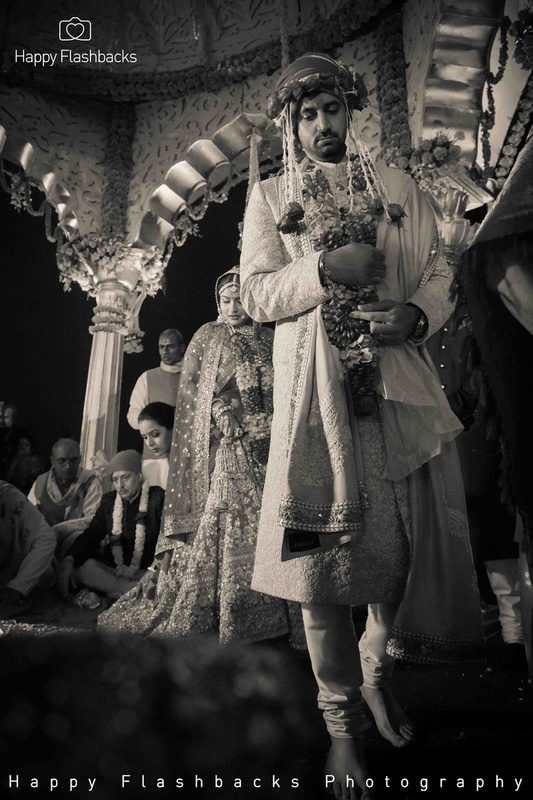 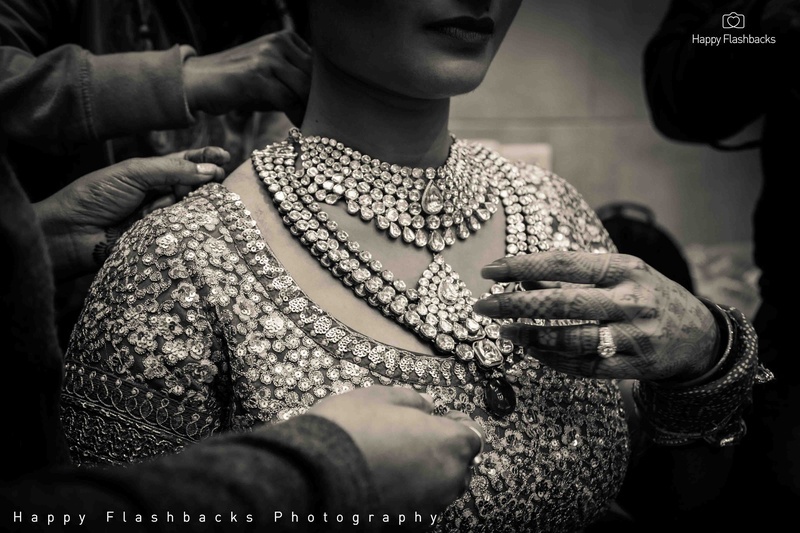 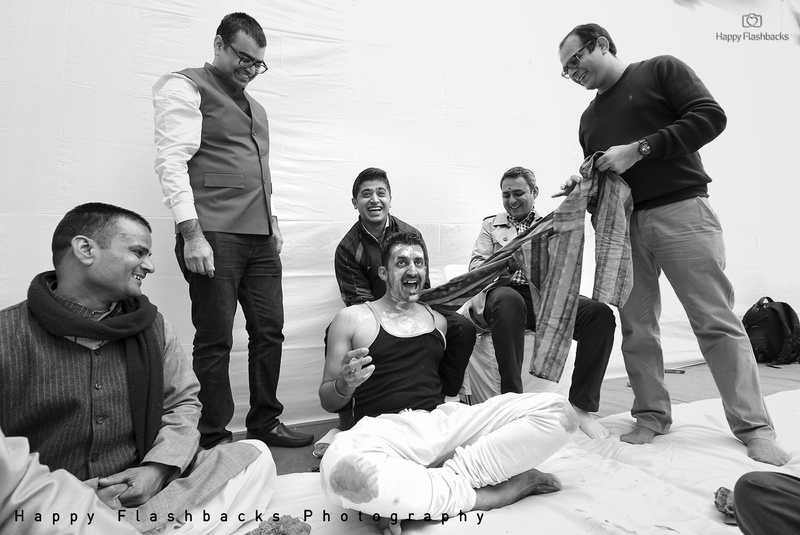 Worth looking at, are the black and white shots of the wedding and the vidai ceremony. 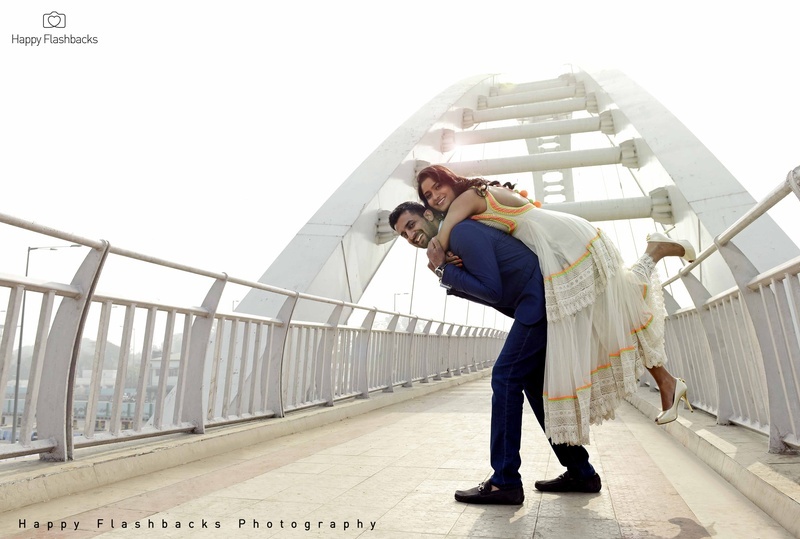 Tushi and Vaibhav’s pre wedding shoot was beautifully styled and executed. 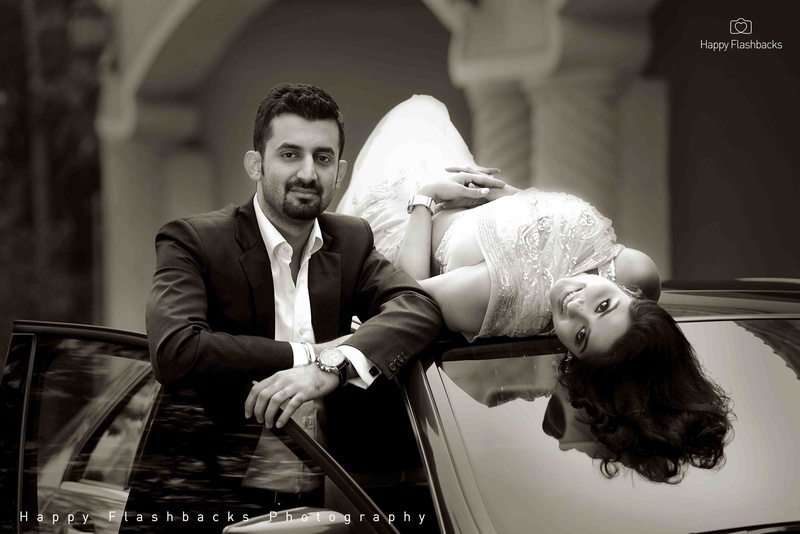 The images were evidence of a love that was comfortable, easy and playful. 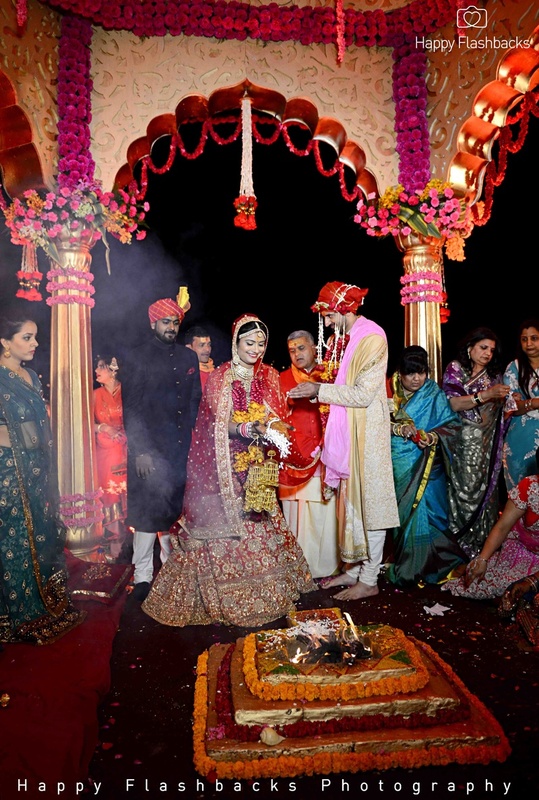 We particularly liked the idea of cutting chai on the sidewalk. 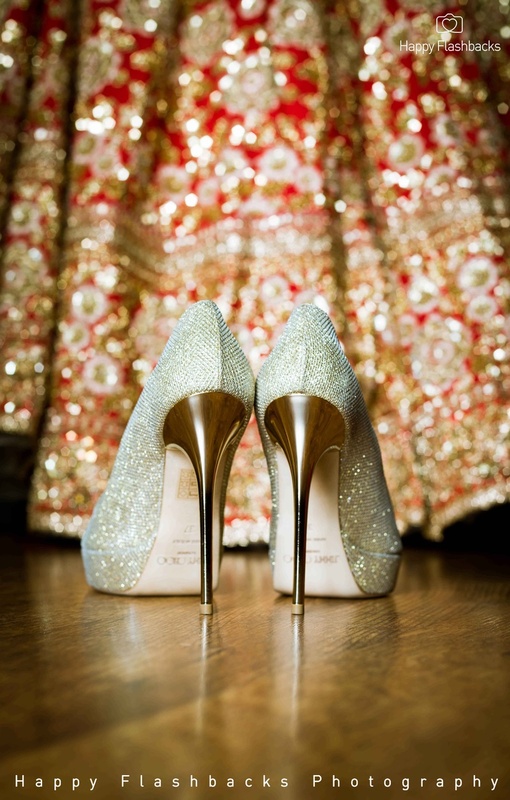 Now that’s a well styled shot, and worth replicating we say! 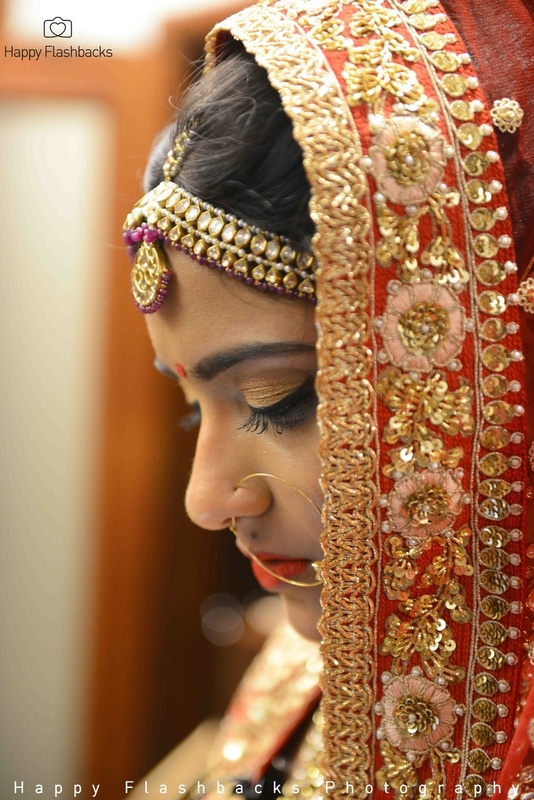 A treat to the eyes, Tushi’s pre bridal and bridal looks are an inspiration to all the brides-to-be in the office. 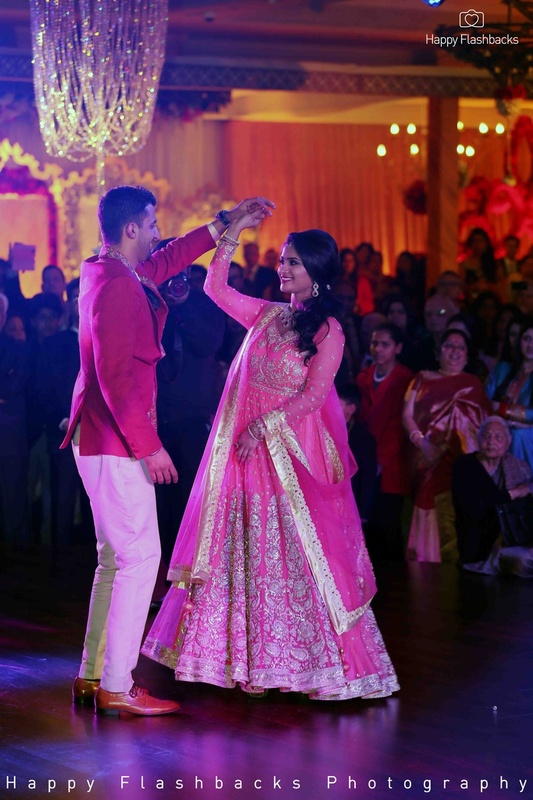 For the Sangeet function, she wore a pink anarkali lehenga with heavy silver kali embroidery on the skirt and the bodice and paired it with a delicate diamond and ruby set. 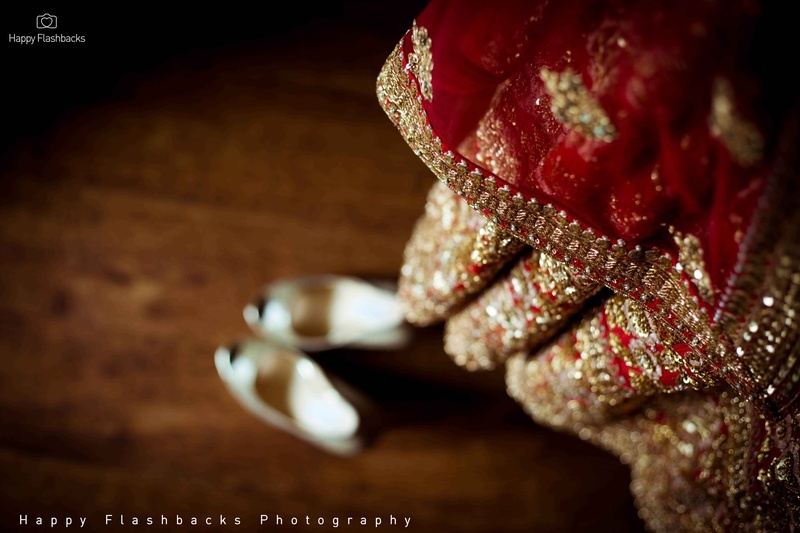 What really blew us away, however, was her traditional red, heavily embellished Sabyasachi lehenga. 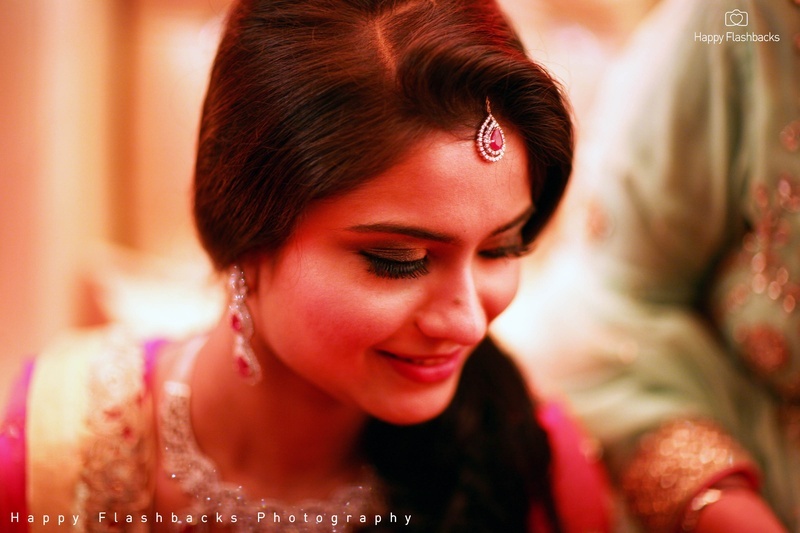 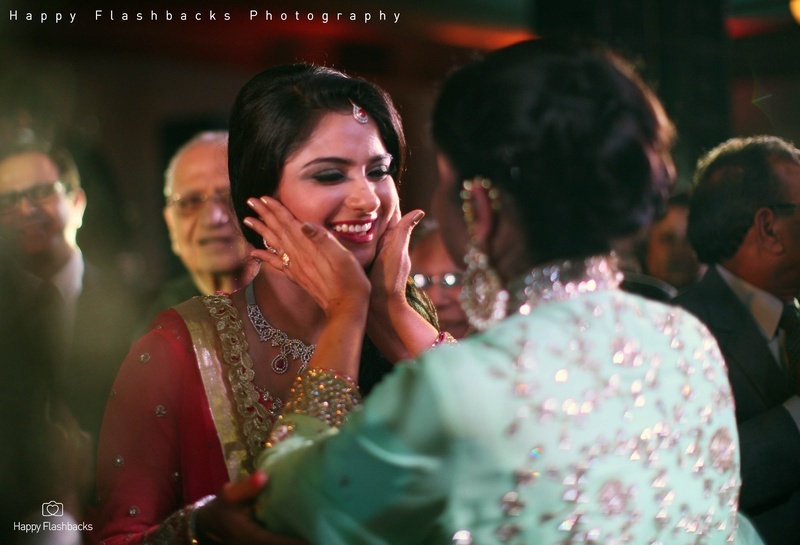 No words can do justice to how Tushi looked on the day of her wedding. 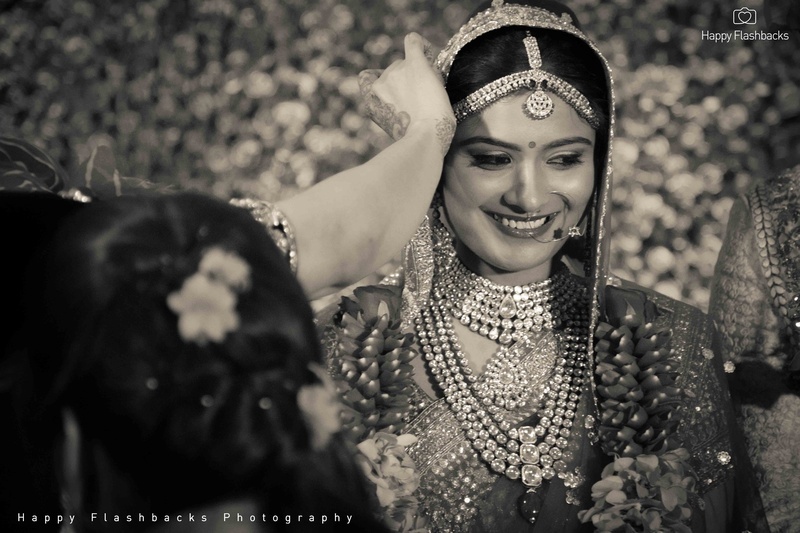 The quintessential Sabyasachi bride with minimal make up, multi strand polki necklaces and the signature oversized nath and mathapatti, she was a sight to behold. 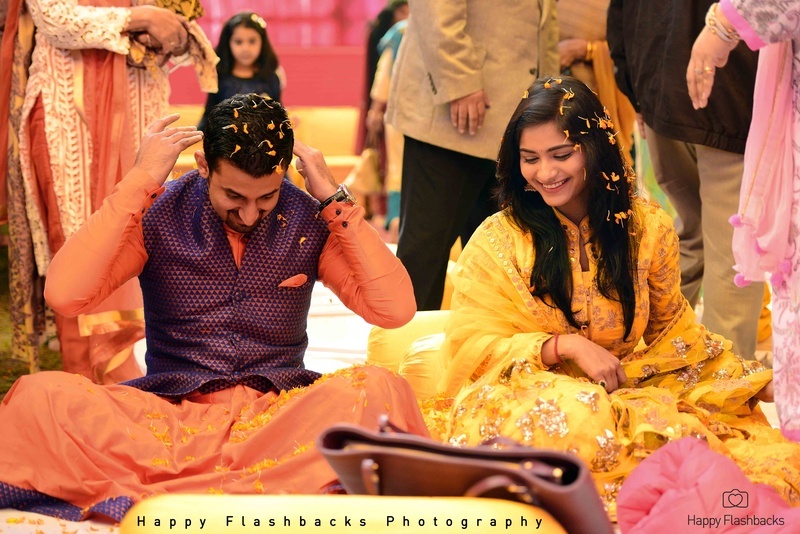 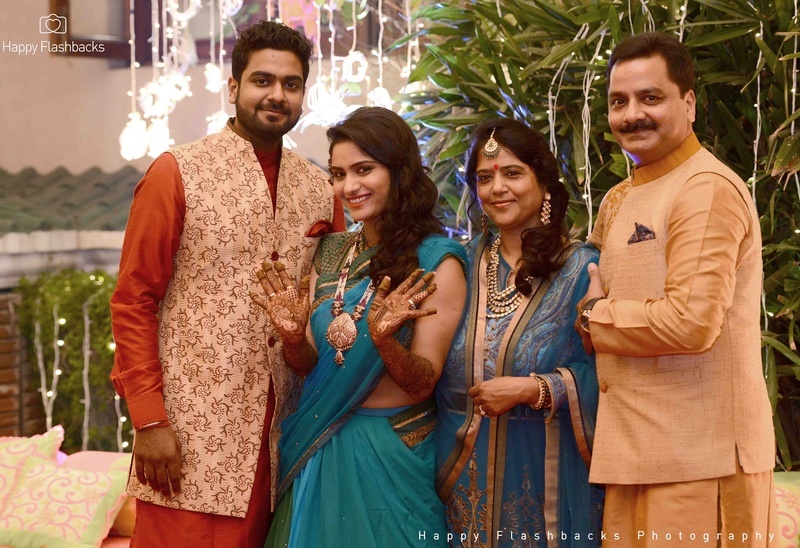 Well-groomed and perfectly put together, Vaibhav, just like Tushi, left us speechless with his wedding attire – a delicately embroidered buttery yellow sherwani with a coordinated dushala and that oh-so-regal multi-strand pearl and emerald mala. 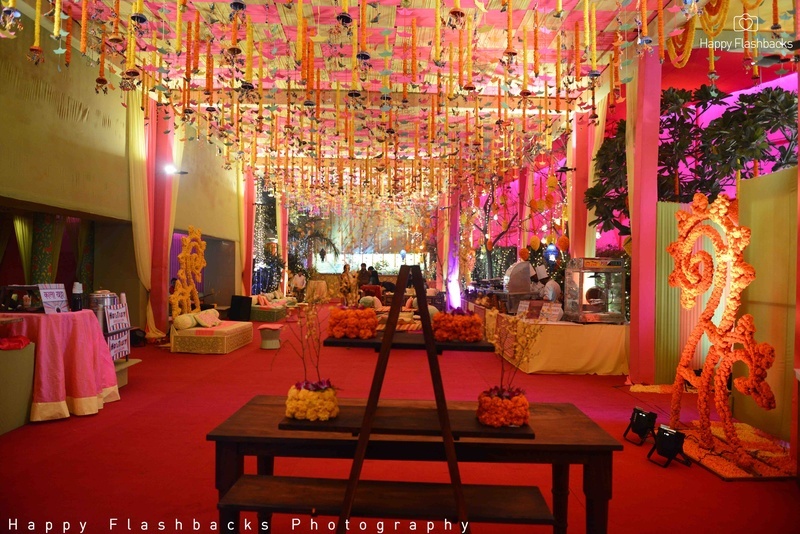 Moving to décor, the vedi mandap, probably a pre constructed temple chatri like structure at the wedding venue was scalloped and laden with fuchsia and yellow fresh flowers alternated with leafy greens. 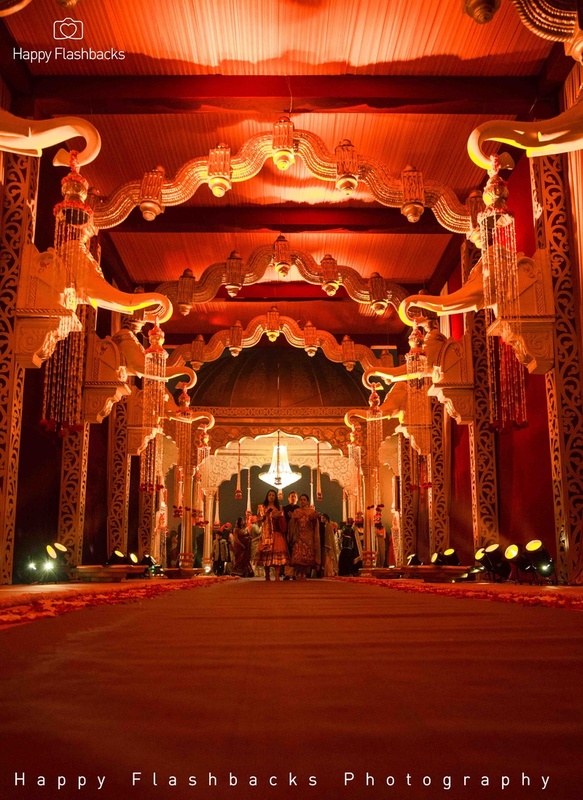 Up lights along the pillars added high drama. 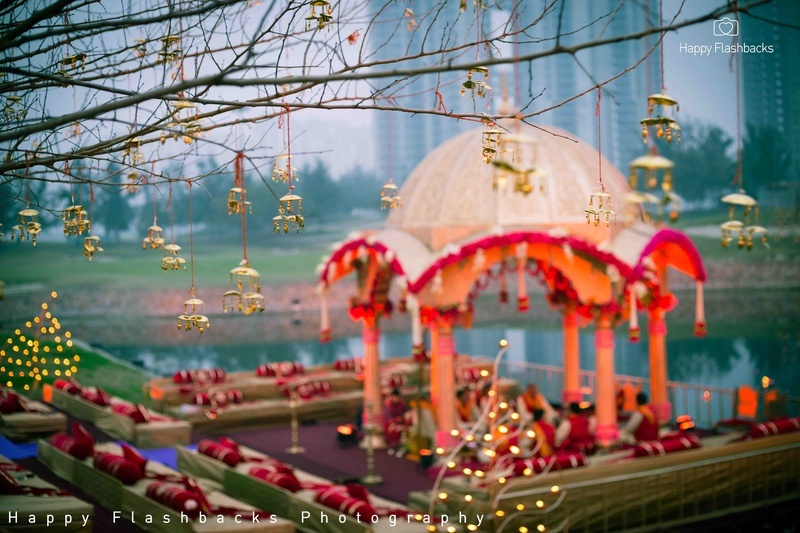 Gold tinkling kalires were used as props throughout the wedding décor and ran as a theme across several elements – casually strung on leafless tree branches, hung on the ceiling and stitched on to the bridal chaddar. 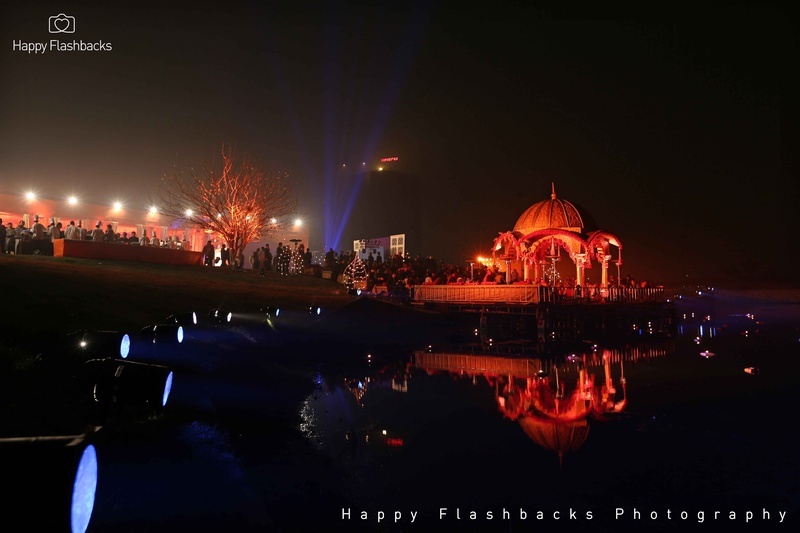 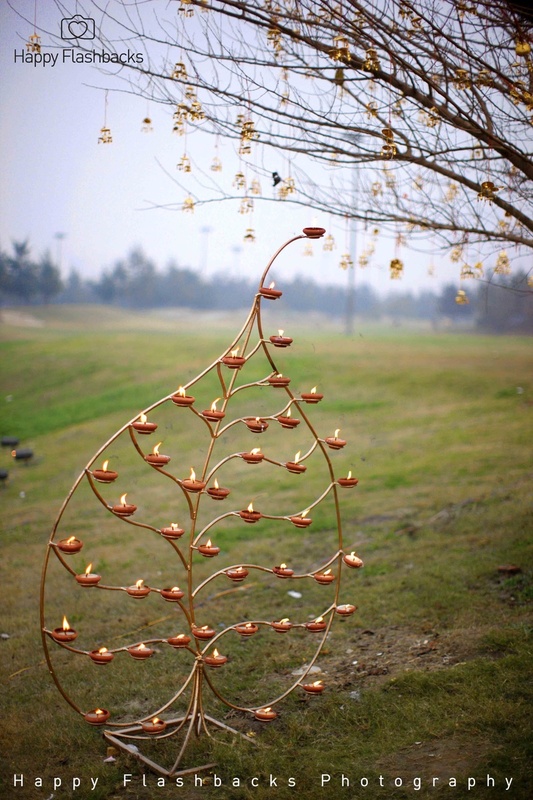 Another beautiful addition were the oversized, leaf shaped, metal diya holders, placed throughout the venue. 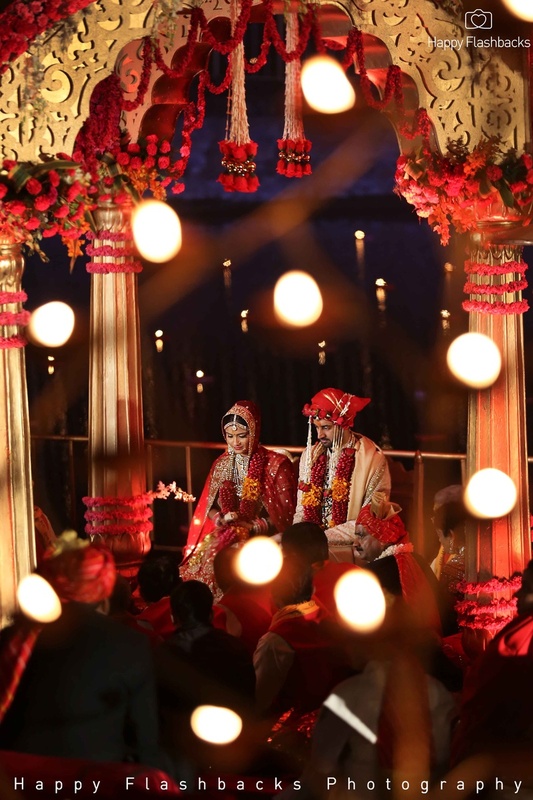 The diyas cast a warm and romantic glow, adding an ancient, almost historic vibe to the wedding venue décor and the ceremony. 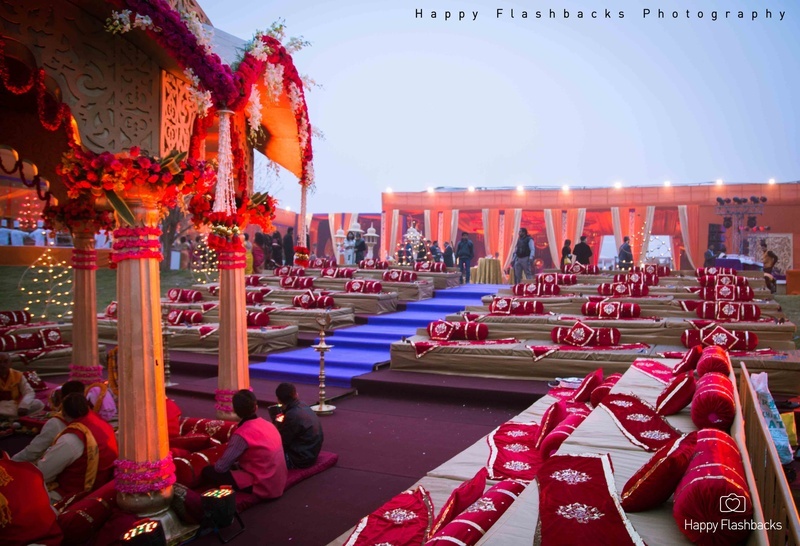 Chowkis covered in maroon and gold spreads with coordinated bolsters add to the splendour, creating a feel of an era gone by. 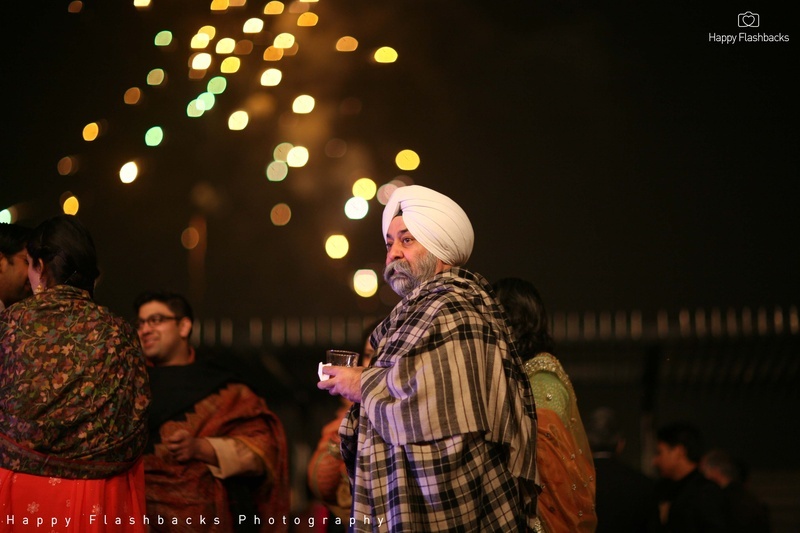 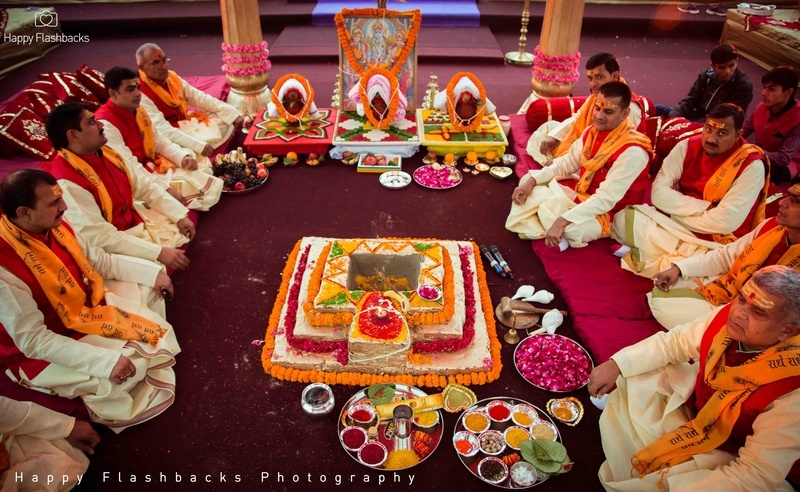 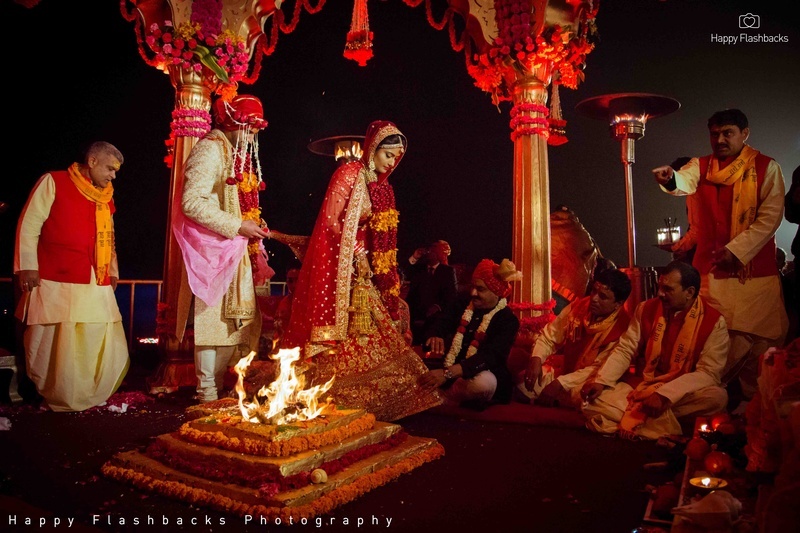 If we were to describe the theme of this wedding, ancient, historic and vedic are the words that would fit right in. 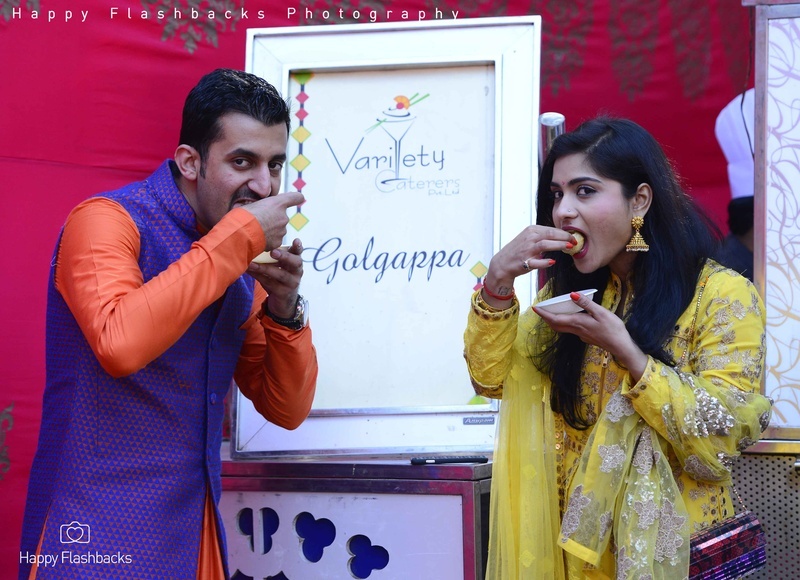 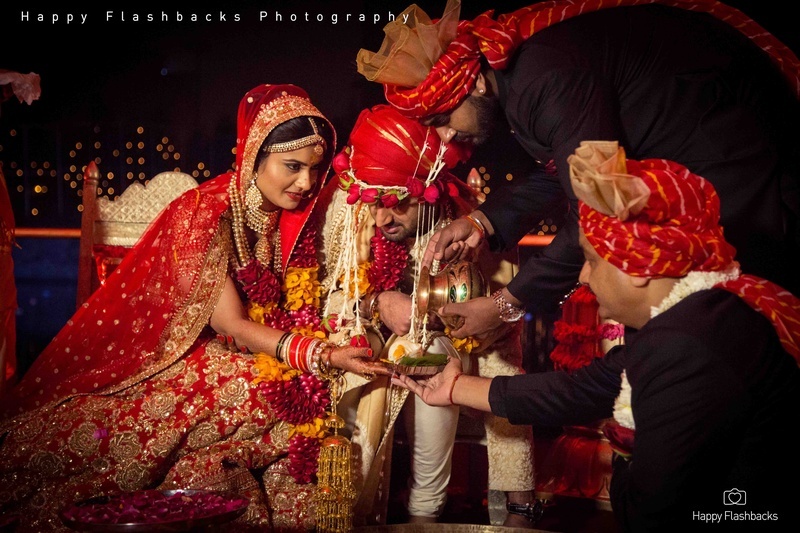 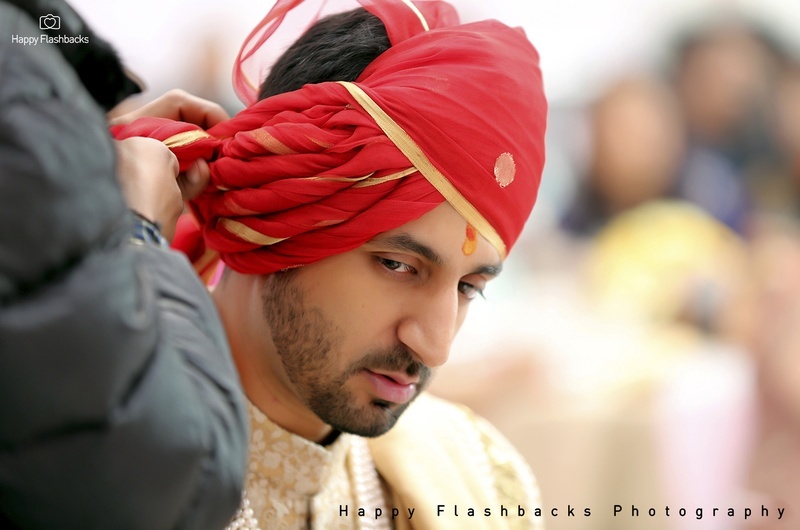 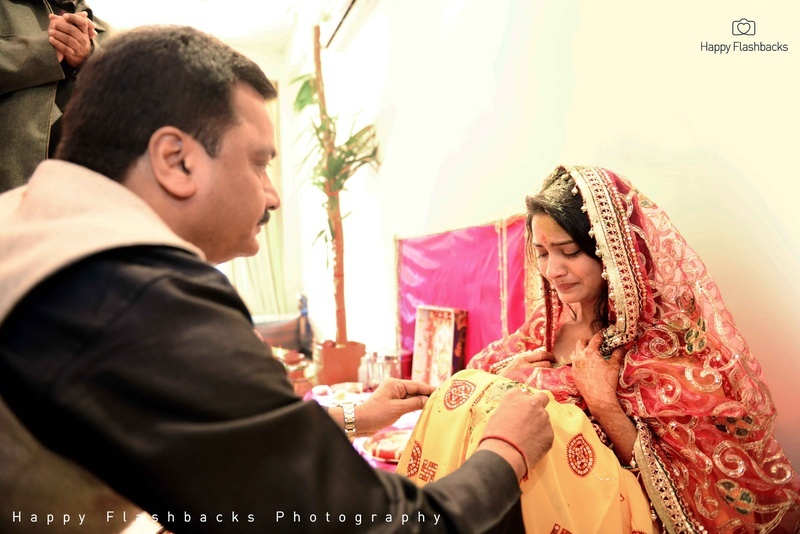 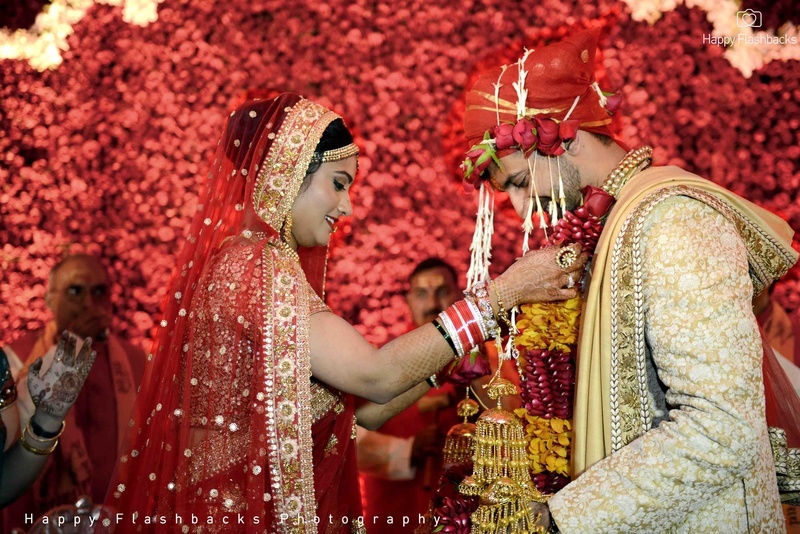 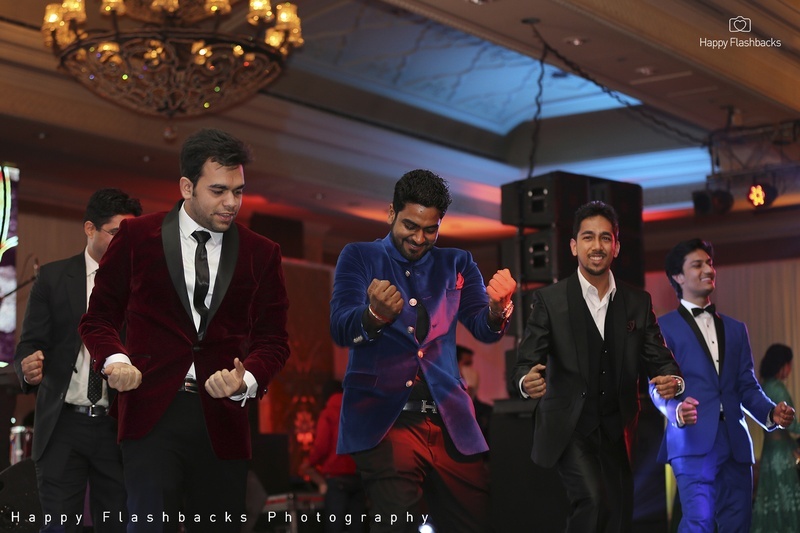 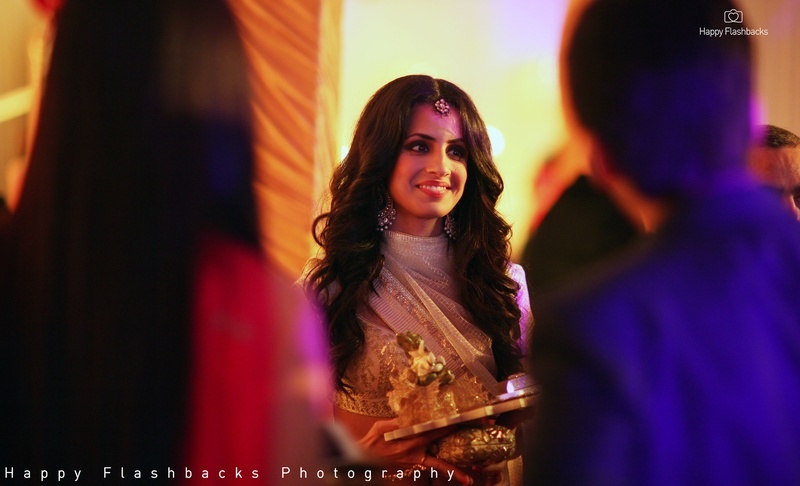 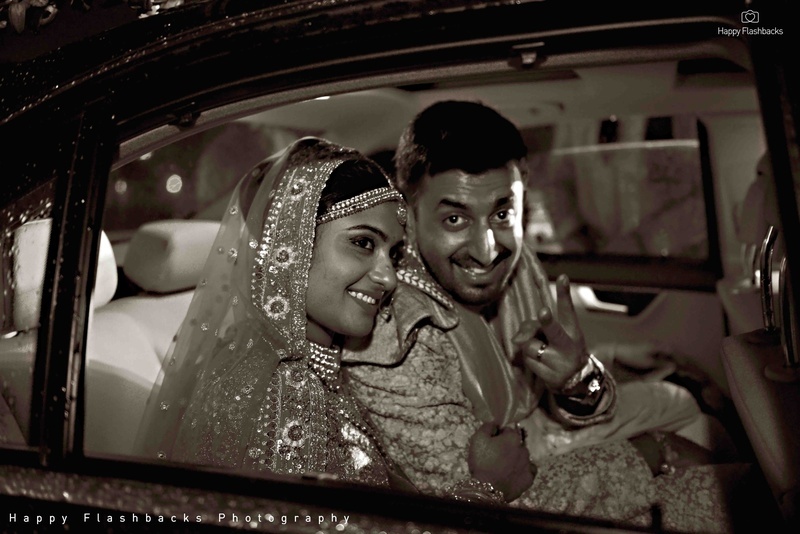 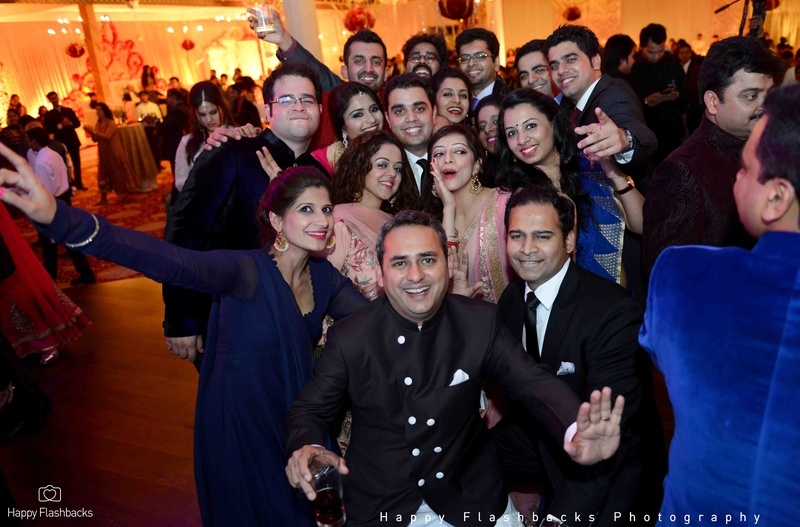 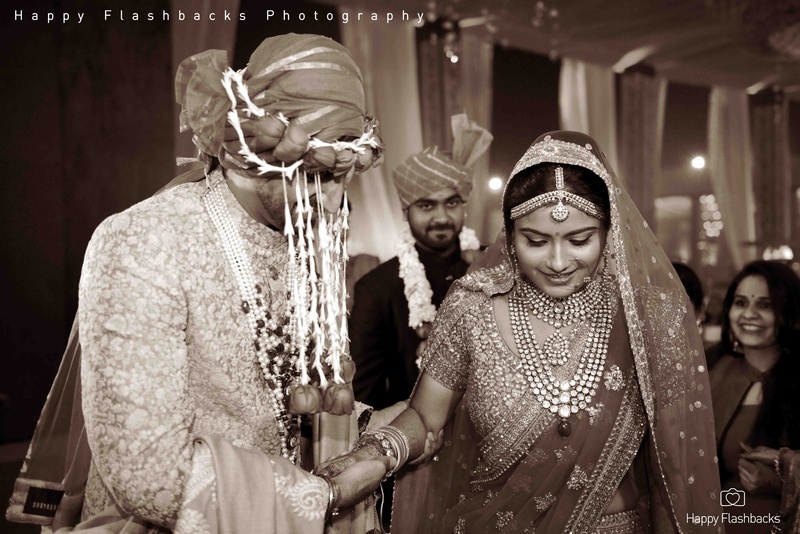 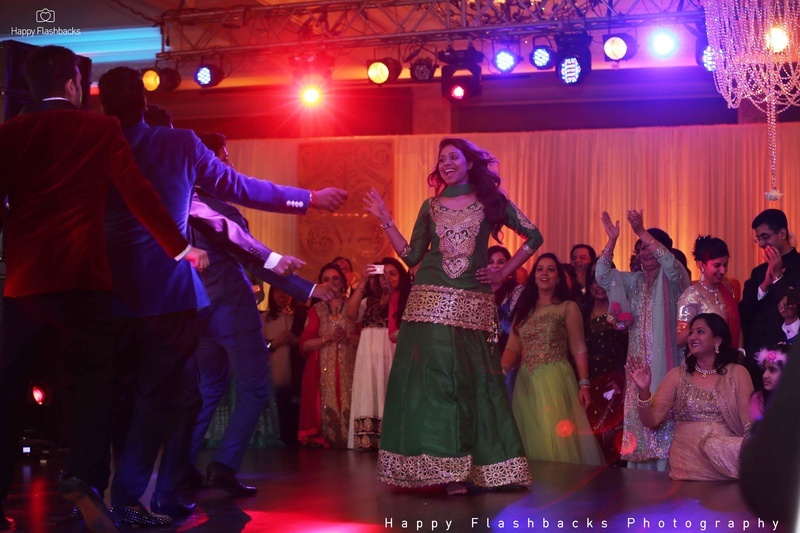 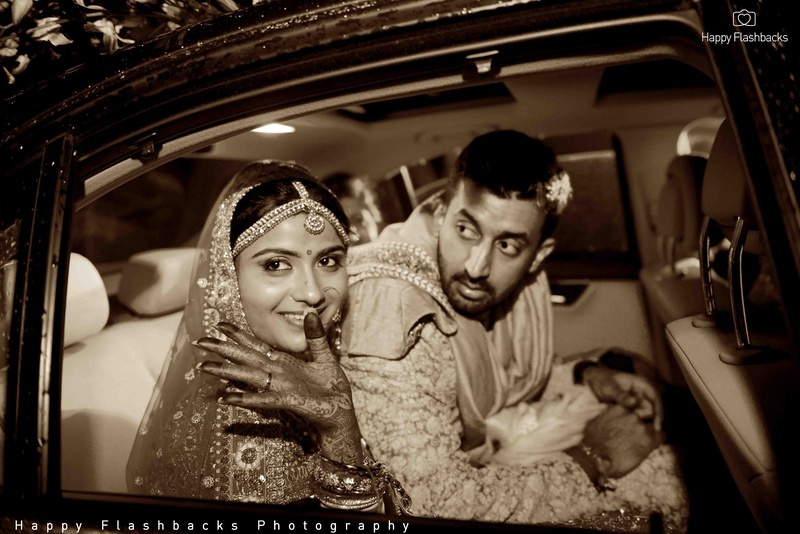 Go through Tushi and Vailbhav’s wedding album to see what we are talking about.